Mmmmm. Kedgeree. It’s a great way of stretching smoked fish to go further. Although it’s traditionally made with smoked haddock, I reckon it works well with other smoked fish too. It may be shackled by visions of country house breakfasts and Anglo Indian majors pashawing through their handlebar moustaches, but in reality it’s a great combo of smoked fish, light curry spices and rice, and it’s great for dinner. So last week, when I spotted some smoked cod in the reduced section of the Co-op, I grabbed it and ran for the till. My preferred recipe is based on a highly entertaining book called “The Prawn Cocktail Years“, by Simon Hopkinson and Lindsey Bareham, which is part cookbook and part social history through food, from post-war hotels to bistros and trattorias. Much as I love the taste of kedgeree, my early attempts involved much faffing around with poaching fish, cooking rice, boiling eggs and then a mountain of washing up. The recipe in the Prawn Cocktail Years involves a single casserole dish and a frying pan and I view as a great improvement. OK so it uses an omelette rather than boiled eggs (controversial!) but hey it still tastes great. As an added bonus, the recipe is genuinely gluten-free, rather than involving any weird and wonderful ingredients, if you or someone you’re cooking for needs an appropriate meal. It’s also great because most of the ingredients are storecupboard staples that I normally have knocking about. If I spot smoked fish, the only other fresh stuff that needs adding to the shopping list is coriander, spring onions and an optional green chillies. Quantity serves 2 greedy people, or 3 being polite. Half a teaspoon of saffon threads, if you have them. I didn’t, so my rice didn’t go so yellow. Half a lemon, cut in 2 or 3 chunks. Preheat the oven to 350F / 180C / Gas Mark 4. Heft your casserole dish onto the hob, melt the butter and add the curry powder. 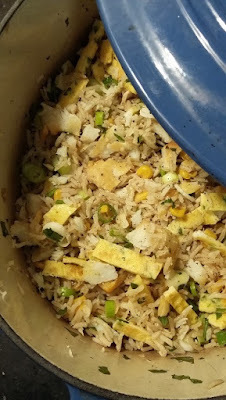 When the butter has melted and the curry powder has sizzled a bit, add the rice and sweetcorn and fry very gently, stirring so the rice gets coated in the butter and curry powder. Next, pour in the stock, add the bay leaves and the saffron if you’re using it. I’d run out, so I didn’t. If you’re keen on the yellow colour, you can always add a quarter teaspoon of turmeric instead. Add the skinned smoked fish, slipping the fillets under the rice. Then put on the lid, put the dish in the oven, and bake for 15 minutes. While it’s cooking, get on with chopping the green chilli, spring onions and coriander. Mix the finely chopped chilli into the beaten egg. Melt the butter in a frying pan and pout in the egg. Allow it to set, making a thin omelette. Flip the omeletter over to cook the other side, so that both sides are pale golden. Then take it out onto a chopping board, allow it to cool slightly and cut into thin strips. When the fish is ready, take the casserole dish out of the oven. Do not remove the lid for 10 minutes. Afterwards, take the lid off, and use a couple of works to flake the fish into chunks and mix it in with the rice. Add the omelette, spring onions and coriander, stir round a bit and serve with a lemon chunk to squeeze over the top. 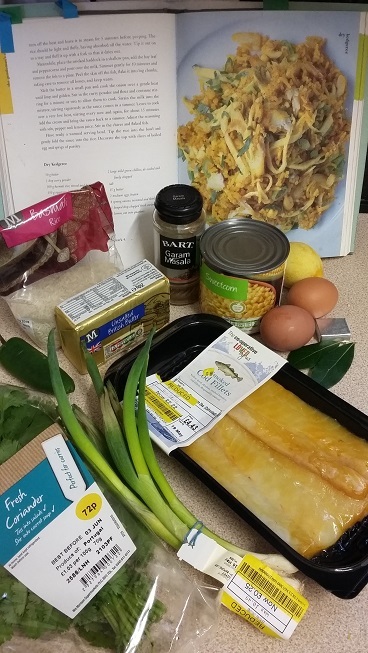 Making kedgeree last week reminded me how I’ve got used to checking the cut-price shelves whenever I’m in a supermarket. Aside from the smoked cod, the spring onions, eggs and green chilli were all short-dated bargains, so this was a great recipe for using things up! I also got to pick a couple of bay leaves from the over enthusiastic tree in the garden. I reckon in total I spent £3.57 on this meal for two, so £1.79 per person. Anyone else willing to confess to a kedgeree habit, given half a chance? Or have alternative recipes for smoked cod? 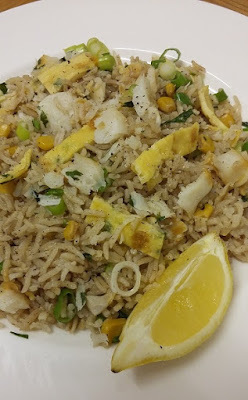 I love kedgeree, but with hardboiled eggs, no sweetcorn, white onions, no chilli, and with paprika sprinkled on the top just before serving. When I was a child, dad worked away a lot, or was on shift, so when he had a weekend off mum used to get up really early on Sunday morning and cook kidneys for dad, and kedgeree for herself and me, she even used to put the food in dishes on the sideboard, we thought it was ever so posh! We've started eating Basa occasionally, Asda do smoked Basa fillets, they're lovely. I do a smoked fish pie, smoked basa, smoked mackerel, a cheese sauce, topped with mashed potatoes. It's perhaps a bit expensive for every day meals, but as a special treat, it's really good! Glad you like kedgeree! Smoked basa sounds interesting, I'll have to see if they do it in my local supermarkets. I love fish pie too, but tend to cheat by buying one of the supermarket packs of fish pie mix, with chunks of white fish, smoked haddock and salmon.